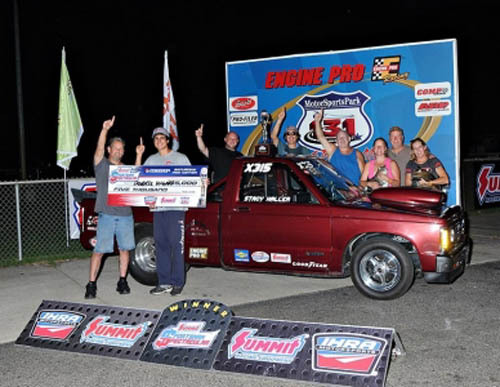 MARTIN, Mich. - Donnie Hagar from Clear Lake, Mich., was clearly at the top of his game this weekend at the International Hot Rod Association (IHRA) Summit Sportsman Spectacular event at US 131 Motorsports Park. With the largest turnout of racers this season, Hagar swept Mod division races at the event and posted a pair of runner-up finishes in the Street division, unique to this event. As part of the fun, he even won Friday night's Scrubblade Golf Cart Race. Other big winners over the weekend included Jason Hemerline and Mark Hammond in the Top division. Alex Kish highlighted the efforts of the Junior Dragster racers with a win and a runner-up finish. Not counting contingency bonuses, both the Mod and Top winners pocketed $5,000 for winning their respective races and runner-up finishers in each division won $1,000. Scrubblade Sunday winners earned $2,500 and runner-up finishers earned $1,000. In Saturday's Mod final, Hagar from Clark Lake, Mich., posted a winning run of 6.415 seconds at 107.14 mph against a 6.42 dial-in with a .067 reaction time. Runner-up Justin Rose from Taylor, Mich., red-lighted by just .003 before going down the track in 6.210 seconds at 111.19 mph. 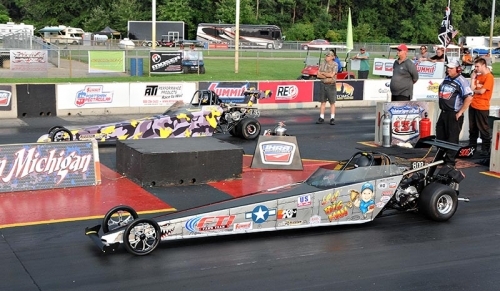 Hemerline from Unionville, Mich., was quicker on the tree to win the Top Final over Rick Schneider from Westland, Mich. Hemerline's package included a .023 reaction time paired with a 5.861-second run at 115.86 mph against a 5.84 dial-in. Schneider was .052 at the start before running a 4.922 at 135.38 mph against a 4.91 dial-in. Hemerline also received a specially designed helmet from Jerron Settles of Imagine That Customs. On Scrubblade Sunday, Donnie Hagar continued his winning ways besting Jimmy Francisco from Shelby Township, Mich., in the Mod final. Hagar posted a 6.421 run at 103.81 mph against a 6.41 dial-in, paired with a .025 reaction time. Francisco had the better launch at .018, but barely missed down the track at 5.953 at 113.52 against a 5.96 dial-in. Hammond from Romulus, Mich., had a quick reaction time to top the Top division. 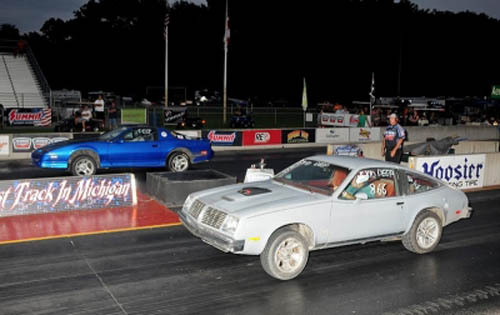 His start of .002 paired with a 6.159 elapsed time at 101.95 mph against a 6.09 dial-in best the efforts of Steve Mesik of Plainwell, Mich., who had a .025 reaction tie and then finished with an 8.362 run at 81.65 mph against an 8.19 dial-in. Kyle Wanamaker from Martin, Mich., had a strong effort with a .008 reaction time and matching his dial-in with a run of 9.241 at 72.06 in the Street final. Hagar had a .021 start and then finished with an 8.888 elapsed time at 74.17 mph. 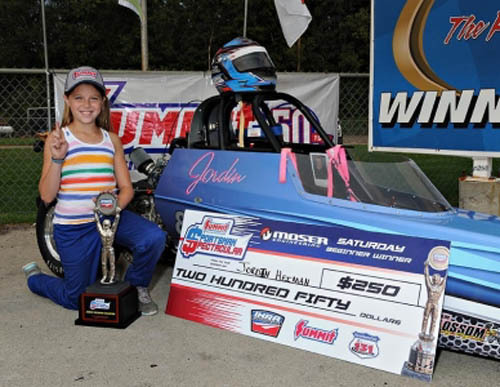 Tobyn Will from Belding, Mich., ended Kish's hopes for a weekend sweep in the Master Jr. Dragster final, which both drivers red-lighted. Will had a 8.243-second pass at 73.21 mph, while Kish broke out with a 7.985 against a 8.00 dial-in. Elizabeth Teter from Benton Harbor, Mich., edged Lydia Kish from Kalamazoo, Mich., in the Advanced Jr. Dragster final. Her solid reaction time of .042 was paired with a 8.983 run at 73.40 mph against an 8.95 dial-in. Kish matched her 8.97 dial-in with a 72.72 mph speed, but lost with a .127 reaction time. 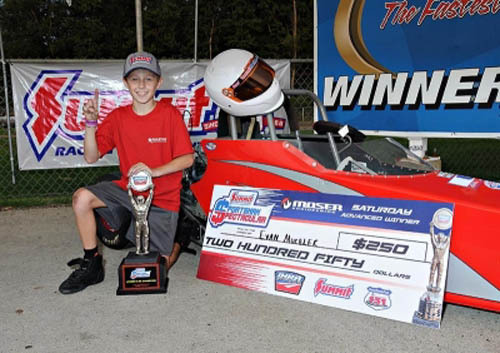 Nick Peters from Howell, Mich., completed the list of weekend winners in Beginner Jr. Dragster. He went down the track in 11.944 seconds at 53.43 mph after both final-round drivers had a .086 reaction time. Runner-up Karlie Denbleyker from Zeeland, Mich., had a 12-second run at 53.71 mph. 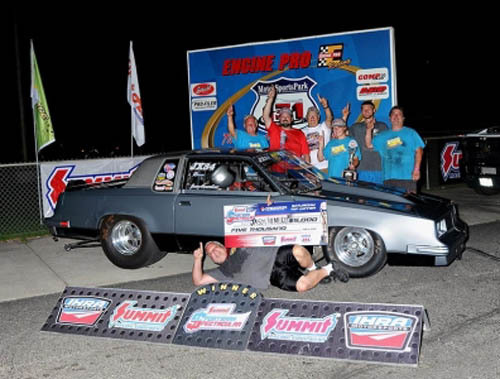 The IHRA Summit Sportsman Spectacular moves to Maryland International Raceway on Aug. 24-26. Click here to pre-enter future events to get two races for the price of one.